Less than 100 miles from Las Vegas, Nevada is the most famous secret military installation on the planet. Rumors swirl around this base, much like the mysterious aircraft that twist and turn in the skies overhead. Although it’s known by many names, most people call it by the Atomic Energy Commission’s (AEC) designation: Area 51. There are several theories about how Area 51 got its name. The most popular is that the facility borders the Nevada Test Site (NTS). The AEC used the NTS as testing grounds for nuclear bombs. The NTS is mapped as a grid of squares that are numbered from one to 30 (with a few omissions). 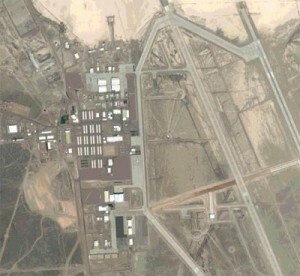 Area 51, while not part of this grid, borders Area 15. Many say the site got the name Area 51 by transposing the 1 and 5 of its neighbor. Another popular theory is that the number 51 was chosen because it was not likely to be used as part of the NTS system in the future (in case the NTS expanded later on). The first documented use of the name Area 51 comes from a film made by the company Lockheed Martin. There are also declassified documents from the 1960s and 1970s that refer to a facility called Area 51. Today, officials refer to the facility as an operating location near Groom Lake when speaking to the public — all official names for the site appear to be classified. The name alone inspires thoughts of government conspiracies, secret “black” aircraft and alien technologies. Facts, myths and legends weave together in such a way that it can become difficult to separate reality from fiction. What exactly goes on in this installation? Why did the government alternatively acknowledge and deny its existence until the 1990s? Why is the airspace over it so restricted that even military aircraft are forbidden from flying through it? And, what does it have to do with Roswell, New Mexico? Each question seems to have a million different answers. Some answers are plausible, while others stretch credulity so far that if someone said it out loud, you might feel the urge to back away from them slowly. These are real images from Nasa, all with strange and very fast ufos. Earth and even images from Mars. Denver UFO sighting The Federal Aviation Administration is investigating a mystery in the sky. A mysterious object flying over Denver nearly caused a mid-air collision Monday evening, 9Wants to Know has learned. As far as investigators know, the mystery object did not . The Maya civilization is one of the most controversial, interesting and less known civilizations that has ever lived on the face of the Earth. What sets it apart so much is the fact that it is a type of civilization .